Russell Harry 'Russ' Crane was born in Southport, Queensland on 11 June 1954 and began his naval career as a Junior Recruit at HMAS Leeuwin in 1970, training as an Electrical Mechanic in aircraft communications. Following selection for officer training in 1972, he began training as a Seaman Officer and was awarded his bridge watchkeeping certificate in 1975 while serving in HMAS Derwent. Following a further posting to sea in HMAS Stuart he pursued Clearance Diving as a sub specialisation, completing the Mine Warfare and Clearance Diving Officers Course at HMAS Penguin and at HMS Vernon in the UK during 1977. He then served in HMAS Curlew and the Aircraft Carrier HMAS Melbourne (II). In 1981 after a short period in charge of Clearance Diving Team 2, he was posted to HMS Vernon as a Mine Warfare Instructor on two years exchange service with the Royal Navy. In 1983, on promotion to Lieutenant Commander, he assumed command of HMAS Curlew. He was then posted as the Staff Officer Mine Warfare to the Commander Australian Mine Warfare and Patrol Boat Forces. He was posted to HMAS Torrens, as the Executive Officer in 1988 and on completion of this appointment was promoted to commander and posted to the Equipment Acquisition Division in Navy Office Canberra. Russ Crane was appointed as the inaugural Project Director for the Australian Minehunter Coastal Project in 1991 before being selected as Commanding Officer HMAS Derwent in 1993. He decommissioned HMAS Derwent in August 1994 and on completion, was posted as the Director of the Maritime Intelligence Centre in Sydney. He was promoted to Captain in January 1996 and appointed as the Chief Staff Officer Command and Control, Communications and Intelligence in Maritime Headquarters. Captain Crane assumed command of HMAS Success on 24 November 1998 and was awarded the Conspicuous Service Medal (CSM) in early 2000. He was promoted to Commodore in March 2000 and posted to Australian Defence Headquarters in Canberra as the Director General Intelligence, Surveillance, Reconnaissance and Electronic Warfare. 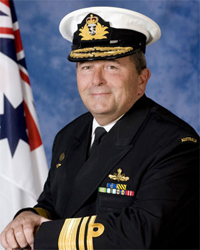 He was the Commander Australian Naval Systems Command from October 2001 before being promoted to Rear Admiral on 1 May 2004 and assuming duties as Director General Coastwatch. He was subsequently appointed as Deputy Chief of Navy in June 2006 and was appointed as a Member in the Order of Australia (AM) in the Queen's Birthday Awards list in 2007. He was promoted to Vice Admiral and appointed Chief of Navy in July 2008. Vice Admiral Russ Crane retired from the Royal Australian Navy on 8 June 2011.